Pasa la brisa con tu propio guía privado y disfruta de un recorrido a pie por Venecia con tus amigos o familiares. Tendrá todas sus preguntas respondidas mientras camina por la Plaza de San Marcos (Piazza San Marco), el Puente de Rialto (Ponte di Rialto), el Palacio Ducal (Palazzo Ducale) y más. O personaliza tu tour de medio día con compras y turismo. 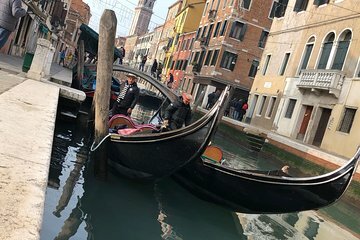 Tour privado de medio día a pie por Venecia con un itinerario personalizado. Escuche cuentos de los venecianos y aprenda sobre la producción de máscaras o vidrios. Our guide was fantastic. Her knowledge of Venetian history was incredible. Skipping the lines made touring more enjoyable. She also provided excellent restaurant recommendations. My family of five just returned from our wonderful trip to Italy. We only had 2 days in Venice so we wanted to see as much as possible in a short time. We decided on this tour and we are so glad that we did! Our tour guide Josephina Josie was fabulous and her English was very good so my family was able to easily understand her. She has lived her whole life in Venice. Josie brought a very local perspective to the history of Venice which you don't get from the self guided or the large group tours. She met us promptly at our hotel at 9:30 a.m. to start our 4 hour tour. Josie navigated us through Piazza San Marco, Doge's Palace, and St. Mark's Basilica and we where wowed by all the beauty and history which she informed us about. We then went on an amazing walking tour through the city of Venice and explored areas which were away from the main tourist areas. My three teenage kids were captivated by all the great sights but were equally interested in hearing about Venice from the perspective of a local resident. We also enjoyed seeing some of the different residential areas and the piazzas where the locals spend time. This tour exceed all of our expectations and I would wholeheartedly recommend it to everyone. It was worth the extra money to have the private tour. If you can, request Josie as your guide as she is great. This was an A experience.